TheRustedChain - The Blog: My studio. I get a lot of questions about where I work. I usually avoid them because it's a bit of a disaster. All the time. But I'm feeling brave tonight so I'll show you around. A shelving unit that holds all my shipping and cardmaking supplies. (Oh yeah, I make cards too! I just don't sell them.) It drives The Man nutty but I know where everything is in this space. 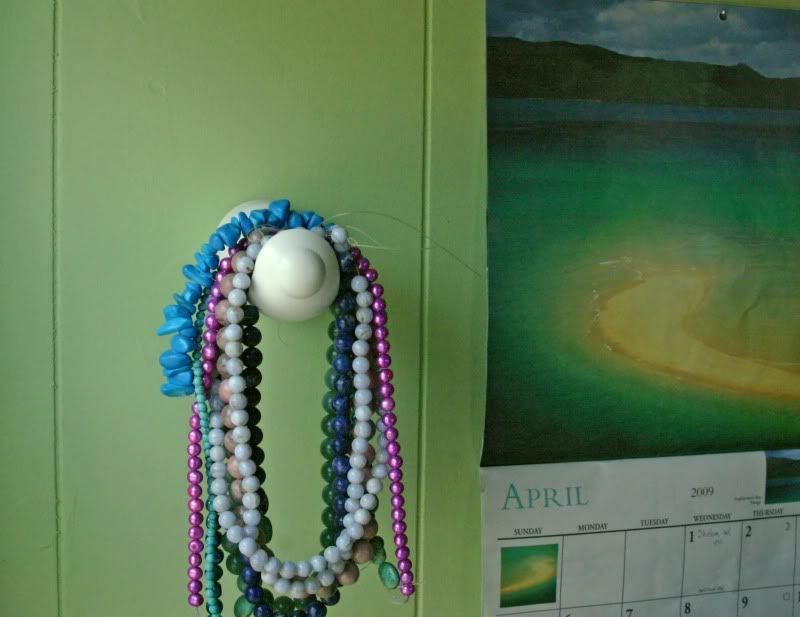 A single curtain rod holder on the wall to hang strands of beads. A shelf with a candle The Girl made for me (see the M for Mom on it? 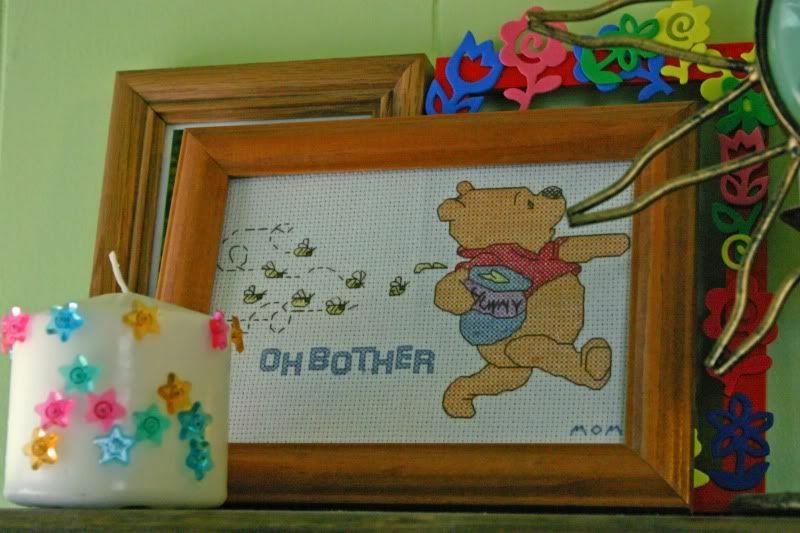 ), a cross stitch I did years ago when she was a baby, a red picture frame covered in stickers made by The Boy, and lots of other goodies. Below that shelf is a big cabinet and on top is a tackle box. That's what I use to store my beads. 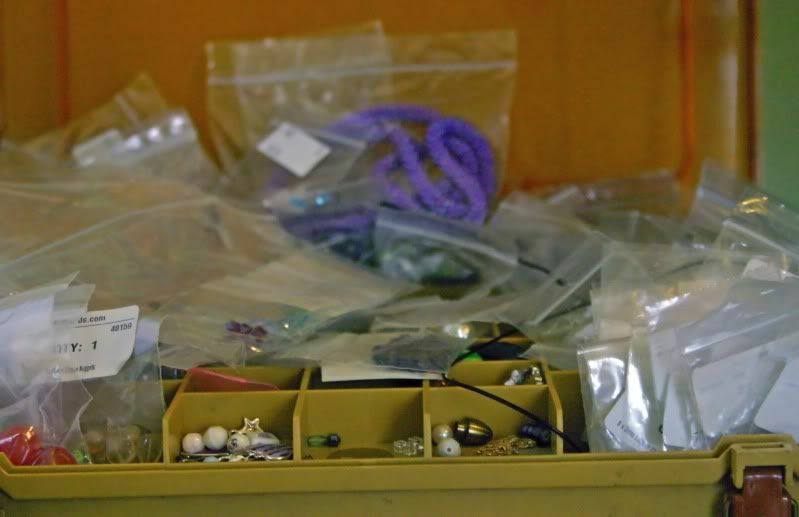 Did you know that beads come in baggies? I have thousands of them. And believe it or not, I know where everything is in this tackle box. Pink Swarovski crystal? Vintage glass? Cherry quartz? I could tell you exactly where they are. 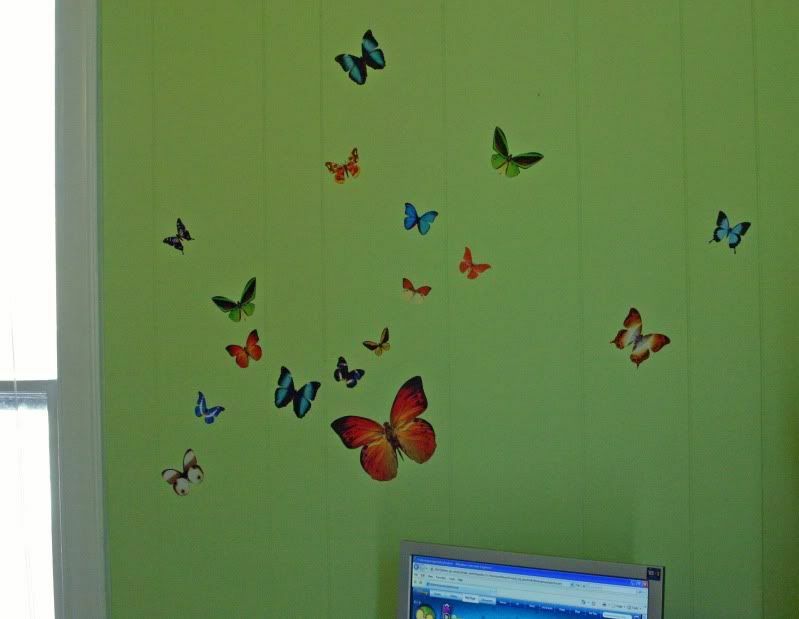 Above my computer I have a wall full of butterflies. Next to my computer I have a couple of mirrors and a D-A-D picture that we did for The Man several years ago for Father's Day. We have wood floors that get dusty so I keep my computer tower on my desk rather than on the floor. 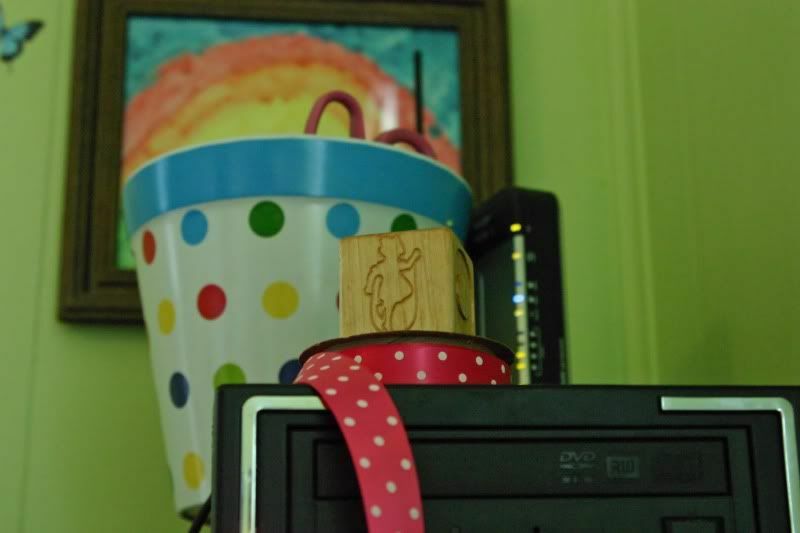 On top of it, a polka dot pot that holds scissors and doodads, pretty ribbon, a Cora's Playground block, and behind it rainbow art. Down on the desk, a keyboard that The Baby scribbled on with a Sharpie while he was watching Playhouse Disney online. He's naughty. 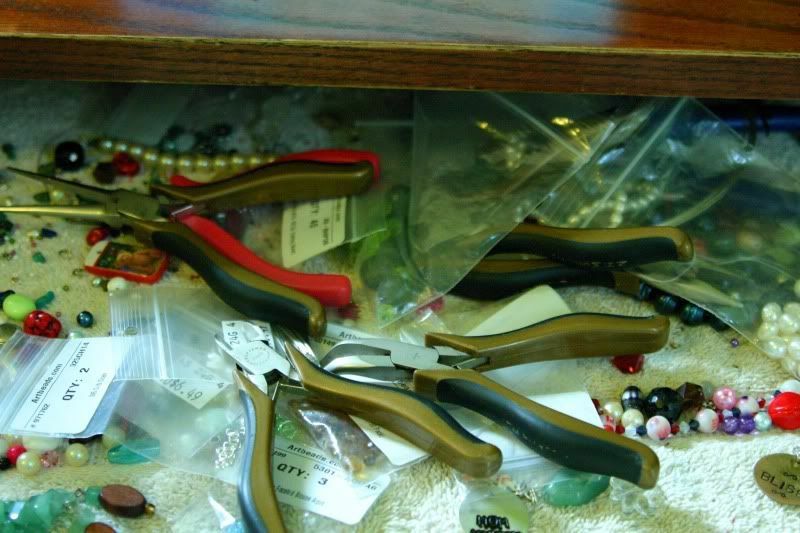 The drawer on the desk pulls out and that's my bead station. I don't use actual jewelry tools. I use Craftsman tools. 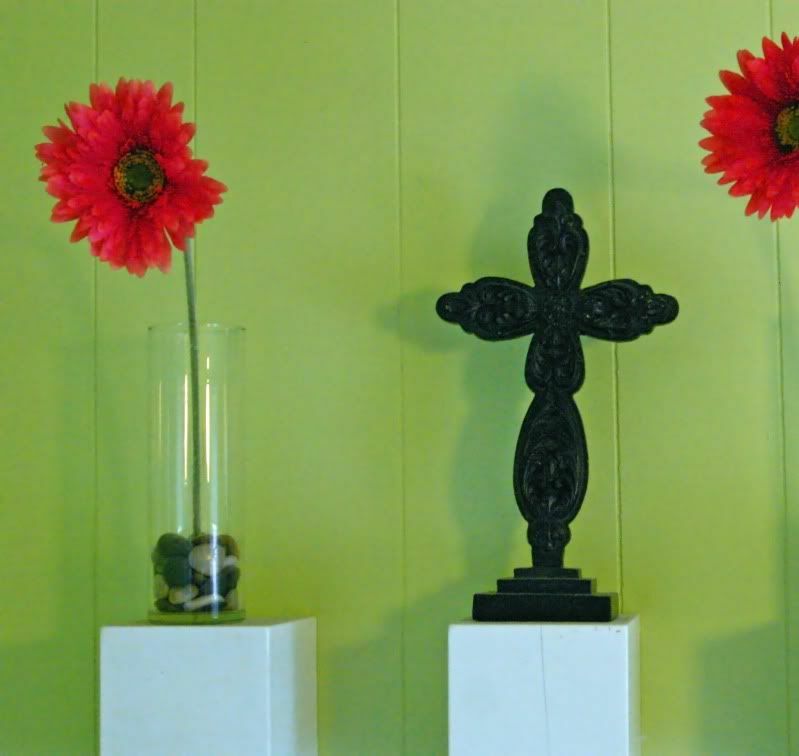 On another wall, block shelves I had The Man make for me, a cross, and cheesy hot pink daisies that I love. This whole room just makes me happy. It's filled with things I love and that inspire me. It's chaos, but I can't create when it's neat and tidy. It has my favorite shade of celery green on the walls. The creative juices flow here! On a different note, I'm off today to meet a fellow blogger, Jen. I can't wait! I hope she doesn't blog about what a dork I am in real life. Thanks for sharing your creative space! My favorite part is the scribbly keyboard! The keyboard made me laugh. So hard. Great studio!! You currently can't even walk in mine! LOL!! Oh your studio is sweet! That keyboard is CRACKING me up though, PRICELESS!!!!!!!!! what a sweet candle from your girlie! and that keyboard...that one made me laugh!!! I *love* the DAD photo. I may have to do something like that for Jared! Oh so many treasure in your studio! I love the "dad" frame. So darn clever!! My "studio" is the food pantry, a table in our bedroom and any spare table ;) drives hubby nuts! I did have one area some time ago, but that space has been occupied by a wee one......that doesn't even really sleep there yet!!! Your craft area looks much better than mine! 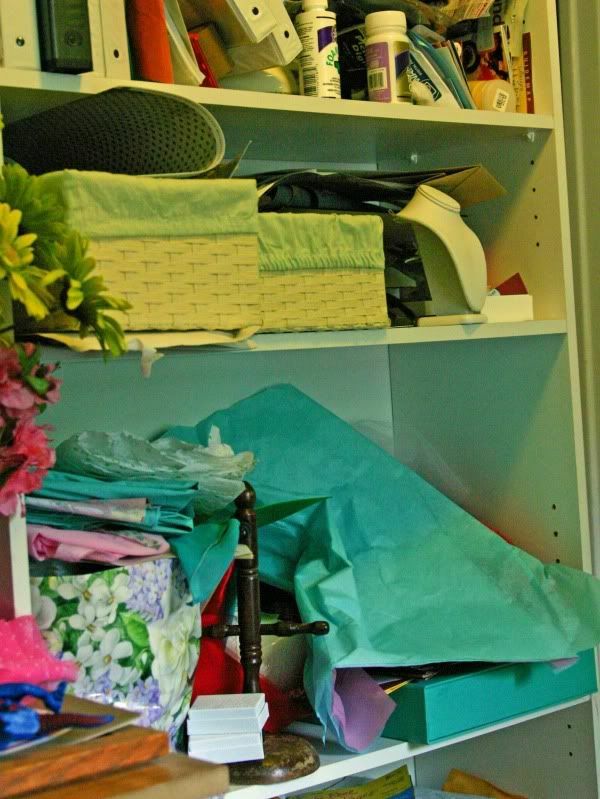 Every day I say to myself I am going to organize it, but then another day goes by and it's still not done. Hope you have a great day out! It's great to get those days for you! thanks for sharing your studio. you're right, studio sounds better. love the colors. and the butterflies on the wall are great. It's so fun to see other crafters' workspaces. I love how you also have things that your kids created in there. And the scribbled keyboard cracked me up!! I can not wait to show my husband the picture of the keyboard. Hopefully, that will help him to not feel so badly about our walls and furniture. The keyboard is the BEST! The keyboard art by Bad Baby is beautiful!!! Thanks for showing us around! Wow. That keyboard is amazing! My wife (Laura) just showed me the keyboard, I am disturbed and aghast as if it were my own. I want to cry. I'm going now to see if she has left any sharpees with the crayons. 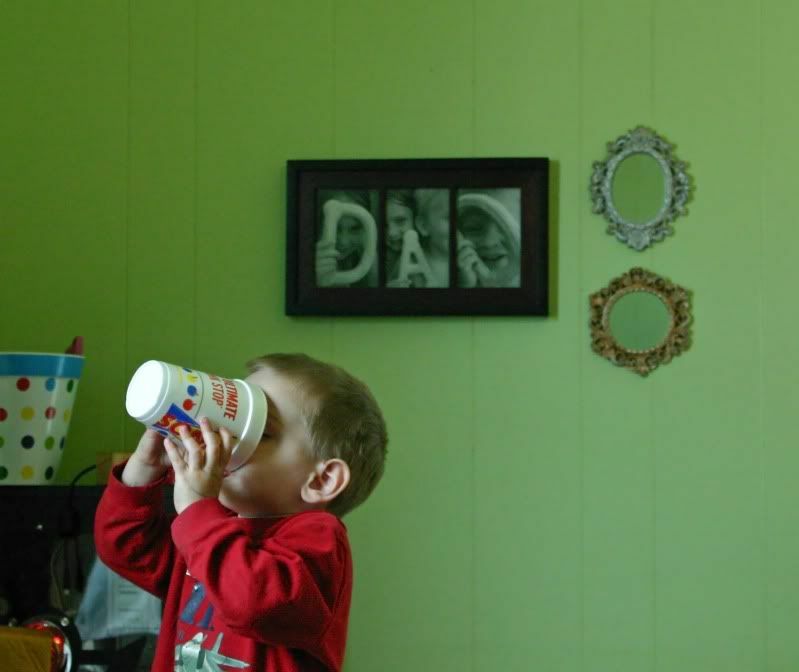 I love the D-A-D photos in the frame. What an original idea! I saw your DAD pic on Tip Junkie and love it! And, I must say that seeing what your child did to the keyboard gave me a good laugh and a "I hope mine doesn't do this". my studio and your studio? would be friends. possibly twins, even. If you do another post on the DAD frame be sure to e-mail the link to me: laurie@tipjunkie.com. My readers are going crazy over it and would love more suggestions. I, too, am here through the link at tipjunkie. LOVE the DAD picture. I am already thinking of doing something like it for Father's Day. That keyboard is hillarious! What a treasured keepsake it must be though. I'll bet you never get rid of it. 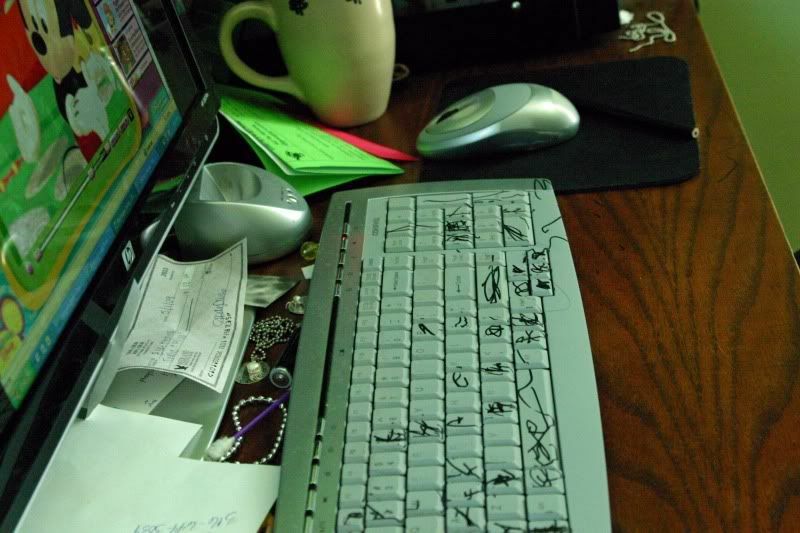 I just had to laugh when I saw the keyboard - My son did something similar - he picked 12 keys off of my laptop! Gotta love those little ones!!! My "studio" is not the most organized for anyone else - but I guarantee I know exactly where something is when I need it! !